I have to be honest from the get-go here: I am an absolutely rabid fan of the original Psychonauts. Seriously, I’ve beaten that game over ten times. At least once a year I run through it again just for fun. At its core, it’s a solid platformer, but what made it so amazing was a combination of excellent humor, an incredibly unique art style, and amazing level design. 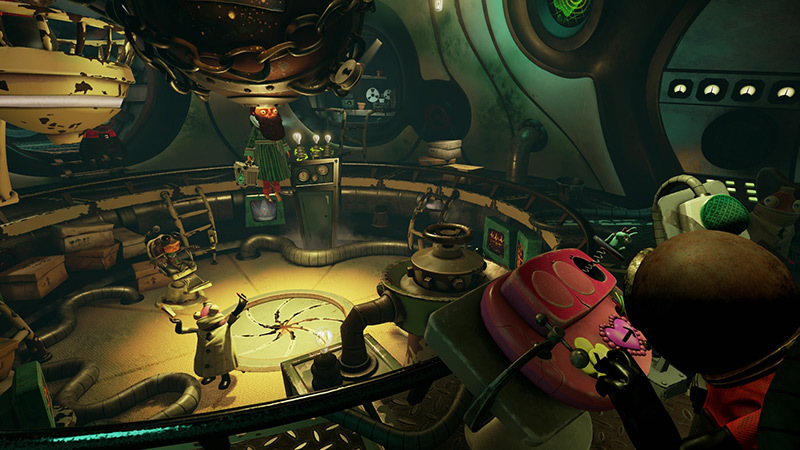 With Psychonauts 2 officially funded and on the way, Double Fine has seen fit to create a VR adventure that bridges the gap between the first and second game. 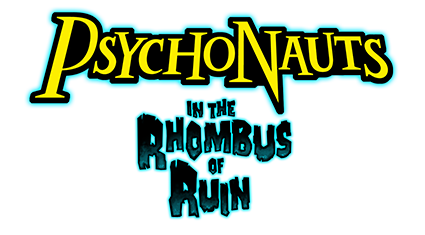 Psychonauts in the Rhombus of Ruin is a point-and-click adventure for PlayStation VR, which is quite the difference from the original game’s genre. Did Double Fine read our minds and provide the perfect VR experience, or was there some psychic interference going on when they came up with this idea? Let’s find out! Without spoiling the first Psychonauts game, it ended on a cliffhanger as a new problem presented itself to the team of Psychonauts at Whispering Rock Psychic Summer Camp. The Rhombus of Ruin begins shortly after this ending and puts us right into the mind of Razputin “Raz” Aquato. The game quickly establishes the plot with a nice opening that gets new fans caught up to speed. The first Psychonauts is also available as download on PS4 if you’re interested in getting caught up that way. Regardless, the plot is easy for newcomers to jump into. I spent about three to four hours getting through the plot of Psychonauts in the Rhombus of Ruin, and I absolutely adored every minute of it. While that may seem a little on the short side, your mileage will vary based on how long you need to solve the puzzles in the game. It’s also a solid length regardless, as the price point is only $19.99. PlayStation VR games have varied widely in length since launch, but a lot of them were “experiences” that didn’t really tell a cohesive story. In other cases, they were simple affairs without a lot of variety. Where Psychonauts in the Rhombus of Ruin truly succeeds is in the strength of the story. As a lifelong fan of the series, seeing these characters again was an absolute treat. It’s a credit to Tim Schafer’s writing that they feel exactly the same as they did back in 2005 when the first game released. It also helps that all the original voice actors and actresses made their return in pitch-perfect form. It seriously feels like they never left, which is huge in today’s world where some sequels tend to stray from the established path. I’m looking at you, Metal Gear Solid, with your switch from David Hayter to Kiefer Sutherland for the voice of Big Boss. Thankfully, the writing, humor, and acting are all just as good, if not better, than they were back in the original title. Fans and newcomers will have a great time in this creative and hilarious world. There are also several nods to the first game throughout that I won’t spoil here. That being said, they were so clever and naturally implemented, that I had to stop and just appreciate the level of detail that went into building upon an already amazing world. While the game takes place in the titular Rhombus of Ruin, the environments vary greatly from section-to-section as you journey to find and rescue your friends. From vast underwater vistas, to colorful hallucinations, and plenty more twists that I won’t spoil here, the story moves at a great pace and culminates in an absolutely spectacular reveal that fans will love. From the opening chapter, to the final boss, Psychonauts in the Rhombus of Ruin tells a story that fans will adore. Newcomers will find a lot to love as well, including plenty of reasons to go back and play the first game. While it does feel like a full and complete story, I only wish there was more of it. It did serve as an excellent transition into the second game, and it also managed to flesh out a familiar character in a really deep way that I appreciate as a fan of the series. The final encounter was epic and satisfying, but the finale went by a little faster than the rest of the game. I expected a final gauntlet of puzzles, but it was more simple than I expected. That’s not really a knock at the game, so much as it’s a comparison of how complete everything else felt leading up to it. This is all mitigated by the excellent reveal and encounter in the final act. The only problem I had with this story was that there wasn’t more of it, but what’s here is substantial and feels complete as a self-contained story. I’d like to close this section of the review with a story of my own. When I worked at GameStop, one year my manager went to conference and got a poster signed by Tim Schafer (the writer of Psychonauts) for me. I still have it framed, but what was funny is the conversation he had with Tim before it was signed. I did not, so Tim promptly responded by saying that I wasn’t his biggest Psychonauts fans. He still signed the poster, which is what mattered. He also made a good point. Now that I’ve played this continuation of the Psychonauts story, and the sequel is on the way, I should probably get that tattoo. 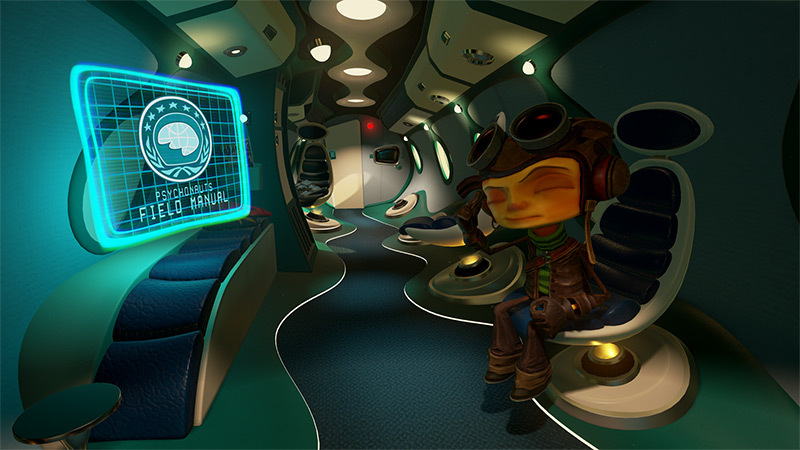 While this new VR continuation of Psychonauts isn’t a platformer, the team went with a point-and-click adventure to minimize the number of people who would feel motion sickness while playing. It’s a smart move, as this style of gameplay makes it very comfortable for people of all sensitivities to VR sickness. These powers allow you to manipulate, burn, and otherwise destroy items in the world around you for the purpose of solving puzzles. In a clever twist, the Clairvoyance ability is how you’ll do the pointing and clicking. By looking at people, fish, or anything with a brain really, you can jump to their perspective with the press of a button. This is how you’ll navigate the environments in the game and generally get around. This mechanic also allows you to get some really unique perspectives that are elevated by VR in a big way. Looking through the eyes of various people will sometimes result in a drastic shift. In several cases, you’ll jump into the mind of someone who is being manipulated by a material present in the Rhombus of Ruin that has intense effects on people with psychic abilities. In these cases, the person you jump into will be hallucinating, and you’ll suddenly see the world from a different and often silly perspective. Solving puzzles from these perspectives provides another unique layer to the gameplay. Other situations will have you jump into the perspective of animals that provide a completely different look at the world. VR lends itself to this in a way that standard gaming never could. Sure, looking at the world through the eyes of a rat doesn’t seem like much on a TV. However, when you’re on the ground with the world towering above you, it’s incredibly immersive, especially when it’s used to solve puzzles that a person couldn’t complete. Speaking of puzzles, Psychonauts in the Rhombus of Ruin is full of them. They range from simple affairs where you have the solution in mind, to complex mind benders that require some strategic or out-of-the-box thinking. It’s a nice mix of difficulties, and the solutions always left me with a smile on my face. The powers in the game slowly build up as you progress, with new abilities being added until the list above is complete by the finale. While the game only has one “boss” per se, it’s an awesome fight, and one that was made even more incredible with the scale that VR provides. The only issue I ever came across during my playthrough was the occasional hiccup with selecting items. You target items, creatures, switches, and other elements by simply looking at them. A white outline shows what you’re targeting and allows you to implement your choice of ability with the press of a button. This worked flawlessly 99% of the time. When it came to pulling or pushing switches or small objects, I sometimes had to tilt my head or adjust how I was looking at the item before it would register. The world of Psychonauts is easily one of my favorite in gaming. The art style is this incredible mixture of interesting character designs and bright vibrant environments. It’s like Tim Burton and Picasso got together and created an entire world influenced by their individual artistic styles. You’ve never seen anything like it, and if you have (being a fan like myself), then you simply have to see it rendered in full 3D virtual reality. This is a world that begs to be experienced in this format. On PS4 Pro, the colors and graphics popped with amazing effect. The environments were wide and varied and changed drastically in size as I played through the game. People will ask if this game could have been done without VR. Yes, I believe it could have been done as a standard PS4 game, but that would have been a disservice to the world and the story Double Fine created here. 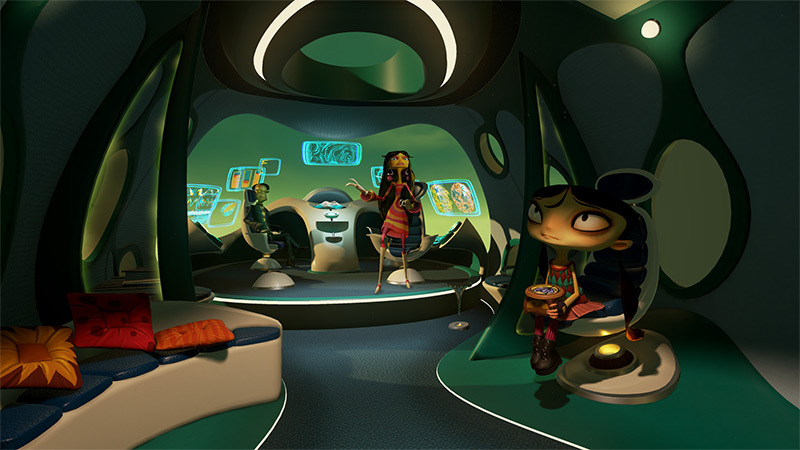 While Psychonauts 2 will return to a standard TV screen, I am overjoyed that we live in a universe where Psychonauts in the Rhombus of Ruin debuted on PSVR. I bought PlayStation VR with this game in mind. It was one of the top title I anticipated for the platform. For fans of the franchise or VR owners hungry for something new, this is one of the best experiences you’ll find on the headset. It’s nothing short of incredible, and it has me counting the months until Psychonauts 2.